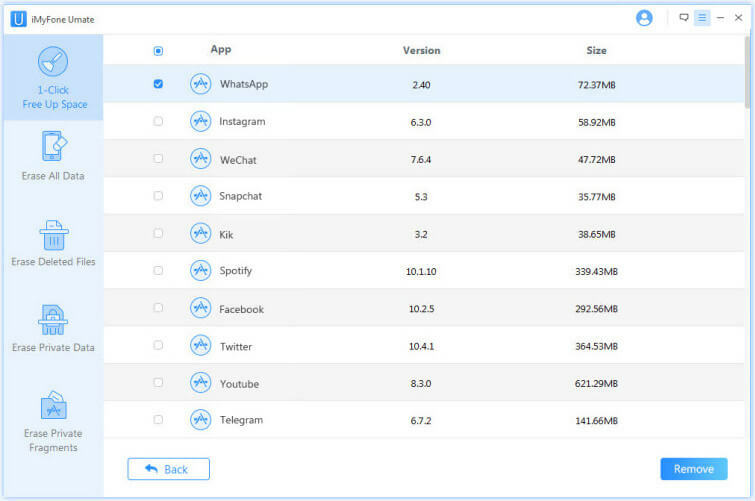 While iOS apps are generally small and don't fill up a lot of storage space, if you have a lot of apps installed then you'll notice that alongside their app data, a lot of your free storage will be filled. This is the main reason that every so often, you should take a few minutes to delete all of the apps that you don't need anymore, and which may be the reason behind your lack of free storage space. When it comes to knowing how to delete apps on iPhone, there are several different methods available and while most people choose to manually delete their apps, going through hundreds of installed apps can be daunting. This is why iMyFone Umate Pro is the ideal program to use and below are some of this program's main features. 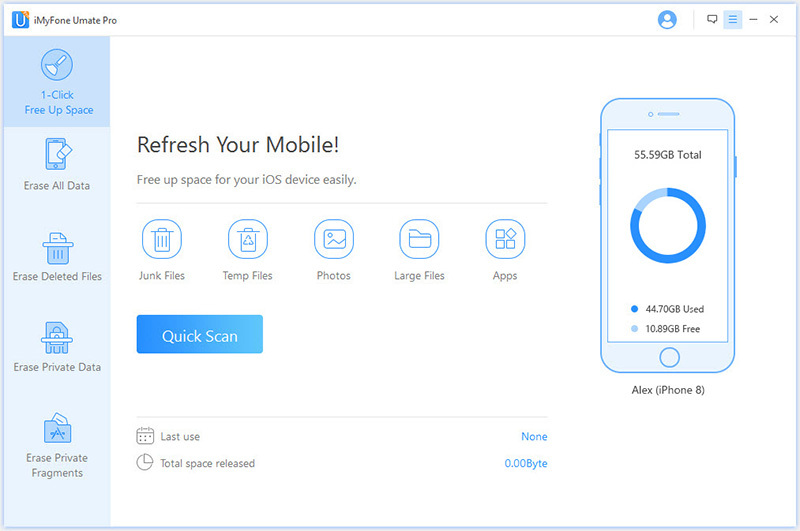 1-Click Free Up Space allows you to scrub junk files and large chunks of data from your iPhone. Erase data that you had previously deleted so that it can't be recovered. Permanently erase all of your device's data. Delete apps and app data from your device to ensure your privacy. 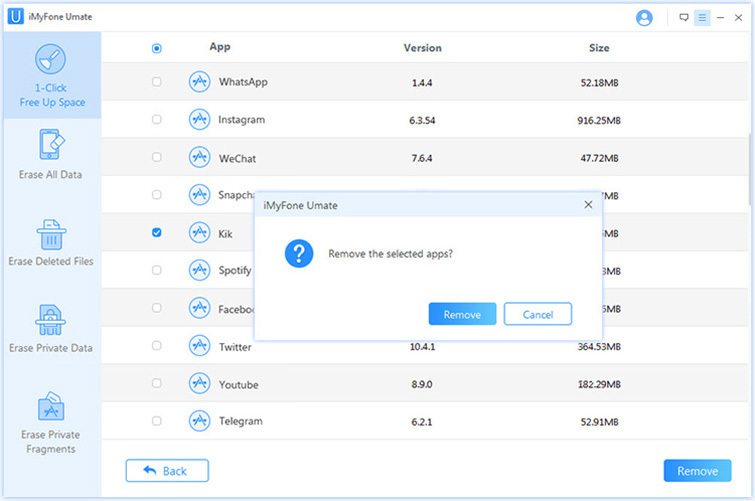 Now that you know a bit about what this program has to offer, we're now going to show you how to delete apps on iPhone using iMyFone Umate Pro. Step 1. Connect your iPhone to the computer with a lightning cable and launch iMyFone Umate Pro to begin. Step 2. Once the program has loaded, you'll be shown some brief information about the process. Click on the "Apps" tab to proceed. You'll be shown a brief list of apps that installed on your iPhone. Step 3. Check all the apps that you want to remove from your iPhone and click on Remove button at the right bottom corner to delete them in bulk. As you can see, it's by no means difficult to delete apps on iPhone using iMyFone Umate Pro and if you take a look at some of the other features that this program has to offer, you get access to some very important iOS data management tools. If using iMyFone Umate Pro doesn't interest you when it comes to learning how to delete apps on iPhone, there are other options available. This is the most basic option that there is. 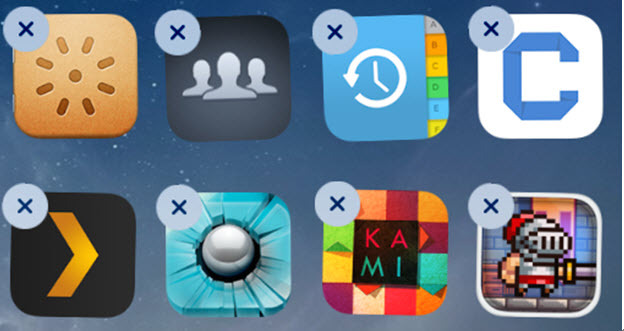 To use the "X" to delete apps on your iPhone, follow the steps below. Step 1. Tap and hold the app that you want to delete until it begins to shake. Step 2. Tap on the "X" at the top-right of the app that you want to delete. Step 3. Select "Delete" from the pop-up, and repeat this with all the apps that you want to remove. However, there are some disadvantages to doing this. Unable to delete multiple apps at once. Very time-consuming if you're trying to free up a lot of storage space. Can't access or delete junk files or app data. Another option that you have is to delete apps on iPhone using the "Settings" app. Again, while this isn't preferable, it's an option. Step 1. Unlock your iPhone and tap on the "Settings" app. Step 2. Swipe down and tap on "General > iPhone Storage". Step 3. Select the app that you want to delete and then tap on "Delete App". Repeat with any other apps that you want to delete from your device. You can also use this method to see exactly how much storage each app is filling up and thus, remove any large unnecessary apps. One of the benefits of doing this to delete your apps is that you can also delete the app data. However, it isn't without its downsides. 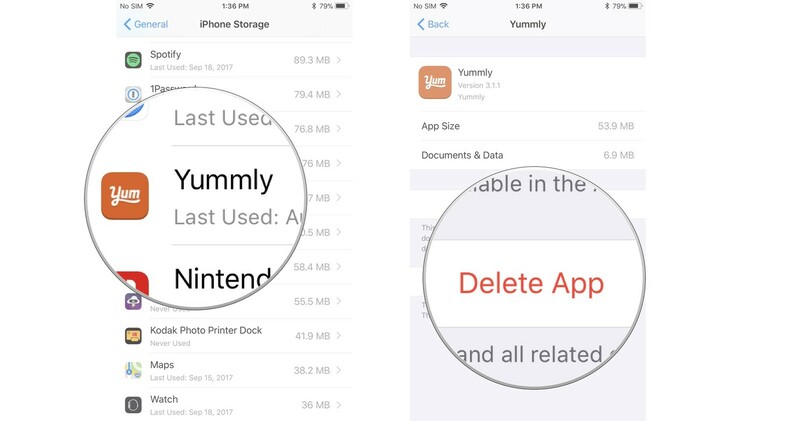 This methods still doesn't allow you to delete apps in bulk. Lastly, you can choose to factory reset your iPhone. This is another time-consuming task although if you're interested in deleting all of your apps on iPhone and you have a lot of them installed, this may be preferable. Step 1. Open up the "Settings" app and go to "General > Reset". Step 2. Tap on "Erase All Content and Settings" and enter your passcode. Step 3. 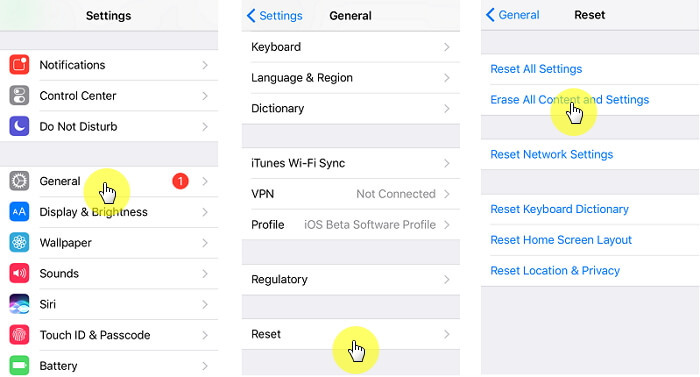 Your iPhone will now begin the factory reset process and after a few minutes, you'll be shown the iOS setup menu. Of course, by using this method, you are also removing your personal data as well; this isn't the only con though. Overly complicated for simply deleting apps. Unless you back up, you will lose all of your personal data. The obvious alternative would be to simply use iMyFone Umate Pro.